At the Wedding Dolls we have really different styles. Whilst Joanne loves a strapless dress I can’t stand them, but only on me that it. They can look absolutely fantastic on the right frame but for me they just don’t seem to stay where they’re supposed to and I’m forever pulling them up. So I’m quite pleased to see more bridal gowns with higher necks and straps coming through. 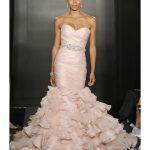 Not everyone wants a strapless number and over the last few years this style has dominated the bridal boutiques. But the Royal Wedding has had a huge influence and now more brides want to cover up with softer feminine looks. So if you’re looking a designer that encompasses all different styles then head over to Elizabeth Stuart. Here’s just a small selection of her bridal gowns now available.